Jeff, at 6'6" you might really like round shields - as it's been said, you could be using those long arms to punch out and give yourself quite a large cone of defense and keep your enemies at a serious range disadvantage. It's tiring, but gee whiz... that's a lot of distance, use it says I.
I'd love to see your square shield, BTW. I tried the round at a fight practice and I may get one of my own but I found that the strain on my wrist got rather painful after a while. The square I use is lighter and just as proterctive and lighter. It works wonders against lefties, two stick fighters and pole arms. We generaly use or large heater/late kite shields "closed", held in tight by the body, and do the head defence with the weapon (when fighting with helmet hits...) Opening up to much can be an invitation to be rushed. Even more so in RL, where you could just walk straight into people and push them over, or punch them in the face with the shield edge. In skirmish closed style is of course the only way to fly, lest you be sniped spears, polearms and other people you never saw coming. With gently curving shields like those illustrated in your earlier post holding them close to the body in single combat against another guy with a shield is suicidal (deeply curved shields, strapped accordingly are a different matter). They can be pinned against the body by your opponent's shield edge. I show how this is done in my paper in Spada II from Chivalry Bookshelf. The last chap who tried to rush me when I was holding a proper outside Guard ran face first onto my shield edge and fell flat on his back. So much for rushing. As you say, in mellee it's quite different as most threats come from people outside your field of vision. Historical images of single combat and mellee combat show shields being used very differently. Jeff, If you're 6'6" and you're being hit on the legs then there's something very badly wrong. The legs should be guarded by distance. If they go for the legs they must expose the upper body as they do so. That's how dismounted knights could fight with guiges on. The shield is not for protecting the legs on foot. At your height you should be able to keep your legs well out of distance. If someone's close enough to hit your legs then they'd practically be in grappling distance! The only work I'm aware of on how large shields were actually used historically are my papers in Spada and Spada II, both published by Chivalry Bookshelf http://www.chivalrybookshelf.com. There are some surprising findings on how the shield was actually used. Sword and shield combat is 90% shield work and 10% sword work. Now my fights are like those described in sagas/chansons, a few well placed blows, not the flurry of blows against a furiously blocking shield that I often see people doing, and which I now find rather ridiculous. The historical material is out there. Historical methods were very effective. There's really no excuse not to use them. There are some surprising findings on how the shield was actually used. Sword and shield combat is 90% shield work and 10% sword work. Now my fights are like those described in sagas/chansons, a few well placed blows, not the flurry of blows against a furiously blocking shield that I often see people doing, and which I now find rather ridiculous. The historical material is out there. Historical methods were very effective. There's really no excuse not to use them. It always looked rather silly to me (the flurry of blows bit), but I think I misunderstand what you mean by '90% shield work and 10% sword work'. Does that mean your shield is being moved about and positioned 90% of the time and your sword being swung 10%? Please clarify so I don't wrack my brains over the mechanics of sword-and-shield fighting too much more.. Besides trying to make my own (and not very good at it), I have found this one that I picked up off of ebay. Very well constructed and wonderful to handle. Hey, I have a Viking round shield by the same maker, I believe. Also got it off of eBay. The rivets and screws are pretty obviously modern, but that could be remedied if I really cared alot. Whatever -- it's a nice shield and it can't be beat for the price (I got it for about $50!). When we do what the duelling shield sections of German Fechtbucher and the rotella sections of Italian treatises tell us to, we spend most of our time with our shields engaged, trying to manoeuvre for position, pressing and hooking at the opponent's shield as we move circularly. We only make attacks with the sword or spear when there's an opening. Making an attack at any other time is suicidal. Bizarrely the fight is reminiscent of Spanish rapier fencing with it's circling and jockeying for position. That's not a similarity I was expecting to see when I started studying these texts. I have a liking for some of the BA shields, too, and have a grudging admiration for the Roman scutum--i like the Republican scuta best tho. *G* yep said that out loud Matt! As far as "active" use of the shield, I know there are several Roman-era carvings which appear to show a fairly "active" use of the shield by barbarians. Of course, in the carvings, the barbarians are generally being slaughtered, so take that for what you will! My favorite shields are probably the transitional ones between the kite and the heater - very long, deeply curved. I haven't made one yet, but I will eventually. I've found myself liking bucklers more and more of late. They're small, manueverable, and their metal construction gives them that extra bit of durability. However, I also really like Kite shields, the classic shield of the medieval warrior. I like bucklers or round shields. Both small(12") and up to 20". I've been looking more and more at Italian pavisari and Spanish adarga type shields. There seems to be less of a tradition of the kite/ heater shield development in these regions of Europe. Most likely because of close connections with Islamic and Byzantine cultures. Earlier shields, Caetra bucklers, Germanic/Scandinavian round shields. Also Celtic oval shields. I really like the targe, as well, but the main reason is that I think they look great. I'm a small guy @ around 5'4 140lbs. For me, a good 12" buckler or a smaller round top kite is perfect. I obviously don't have the ability to beat most normal to tall sized males in a pushing war. I have to move and make people come at me until they make a mistake or overextend that one time causing an opening. Thus, I love the smaller shields for their speed and agility. Bucklers are especially nice for their ability to strap easily with the sword on a belt and thus always be comfortably with someone. Add all that together and I have no trouble seeing why the buckler was the most popular defensive object of the middle ages. Pic is what I mean by smaller round top kite. Well mine is of course the Viking Shield! I have one of Allan Senefelders Kite shields and I was wondering about the construction of it: The Mercenary Tailor's site mentions 1/2" poplar as the shield's wooden core. I was wondering if the shield was made up of planks and how they were joined and curved. I was assuming that this shields was made of some sort of planking because a piece of poplar this wide would have to come from a VERY BIG tree and there is no mention of how it's put together. Now to my " pleasant " surprise here is how these are put together: Quoting Allan's E-Mail to me " The curved shields are made from four layers of 1/8" thick poplar plywood that we glue together and put in a press to give the curvature. " 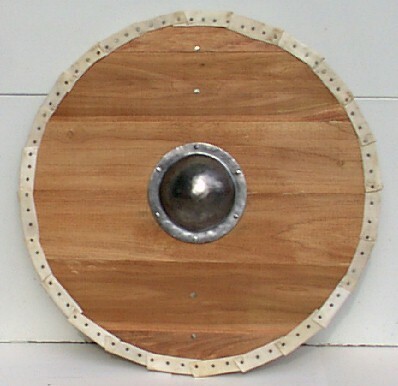 I have mentioned to Allan in a return E-Mail that he should change the description of this shield on his site to explain that the poplar is made up of layers in a plywood type construction as this is a very desirable feature as it should make for much superior strength and resistance to damage i.e. splitting or piercing. As using shields that can survive longterm use this is good to know. This IS a shameless plug for Allan as he has always been one of the best vendors I have dealt with. I've always used a simple round shield. I find it light weight and granting just enough protection. I tried the roman style of virtual portable pallisade, but I didn't like getting it stomped/kicked all the time. I made my first round back in 6th grade in shop class. I told the teacher I would put the "legs" on my "table" when I got home. I've tried bucklers, targets, adn the afore mentioned body shield, but after buying MRL steel shield, I'm still contecnt with the round. The only thing I dislike is the required closness for a shield punch with the round. I still feel awkward that close. Here are the two I have, one truly copper, the other a painted MRL steel shield. (my old shop project, though it survived stopping arrows, axes, .22LR, and many other barrages) is tucked in my closet due to is sad state over the years. I also prefer the round shield. Im not quite sure why, it just feels right. 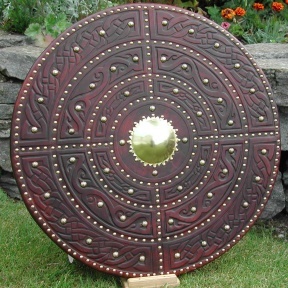 Oval celtic shields are also very nice. I think I'm just attracted to those shields because of my fascination with vikings and celts. Thats a nice looking collection you have there. May I ask where you got your copper shield, it looks very nice. Did I say 'targets', I ment 'kites'. Thanks, the smaller copper shield was a DIY project. Copper ikebana arrangment base+ elbow grease.